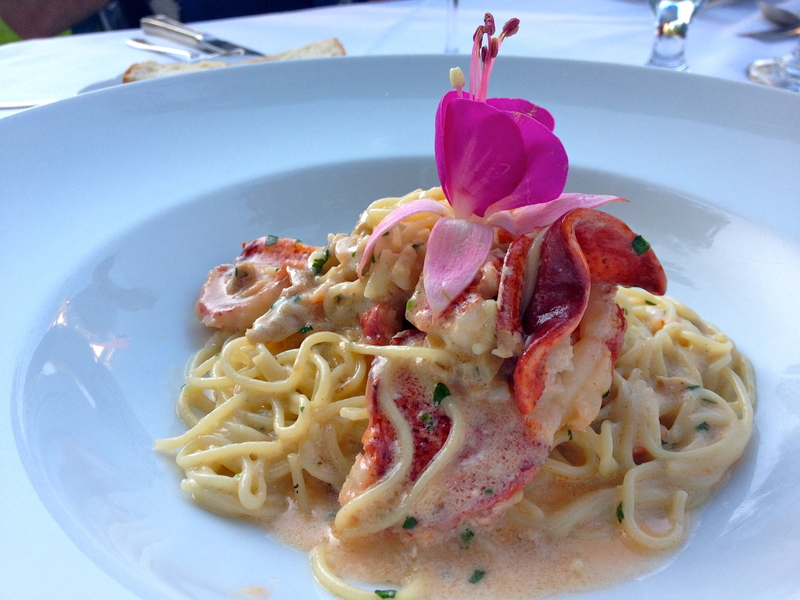 A perfectly irresistible dish: Joe Palmer House’s Lobster Newberg. Every once in a while, and never often enough, a perfect day comes around. With no set formula, no particular sequence, it’s impossible to create a day like this; if you try, it never feels exactly right. You can plan the events, but something intangible happens to make a day perfect. Last Saturday was a perfect day. After weeks of rain, the sun was shining and the weather forecast promised temperatures more in line with July than early May. Awakened by chirping birds through open bedroom windows, we started our day feeling optimistic. A mundane commitment, mulch delivery, was due sometime between 10am and 1pm, but the guys arrived an hour early, freeing up some time for a brisk walk before meeting James and Zandra for our quarterly wine-tasting tour. Joining us were Ken and Michelle, for whom this was a wine-club pickup round. We’d never met Ken and Michelle, but I could tell by the laughter and they were genial and easy to be around. Our first stop was Zerba Cellars‘ tiny tasting room on the main strip into Dundee. From there we went to Natalie’s Estate Winery in the foothills of the Chehalem Mountain AVA. And our last stop was De Ponte Cellars, a perennial favorite for the breathtaking views from the patio and, of course, their beautiful wines. Ken and Michelle had brought a small cooler with cheese, salami and crackers, so we ordered a bottle of De Ponte Pinot Noir rosé, and soaked in the still-novel sun. Cheese devoured, wine gone, we purchased the wine we can never seem to leave without, and were on our way to the Joel Palmer House, the culinary shrine to mushrooms in nearby Dayton. Seated at our pleasant patio table, early-evening sun filtering through the trees onto the crisp white tablecloth, we knew we had one of the best tables in the house. 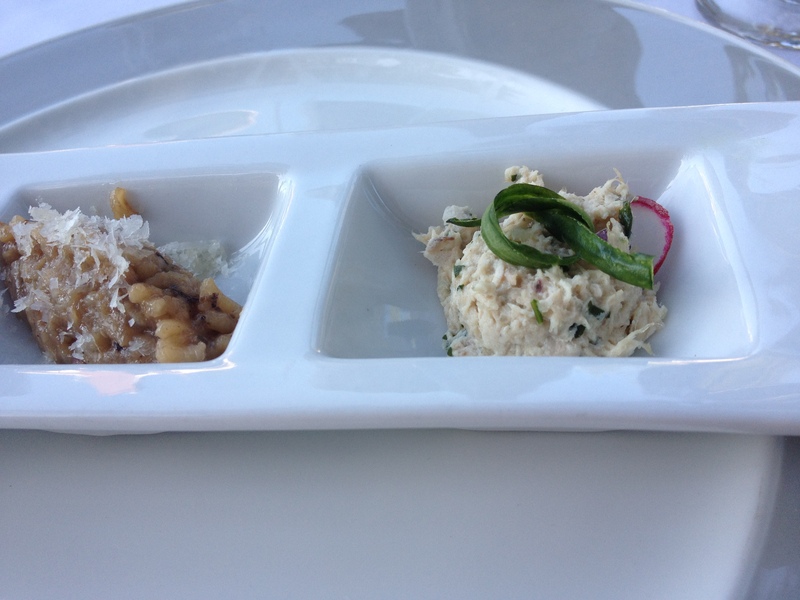 Our meal commenced with an amuse-bouche trio: a delicate prawn, a bite of wild-mushroom risotto, and a taste of Dungeness crab salad. This fanciful gift was followed by our shared appetizers that started with six delectable Yaquina Bay oysters, one for each of us. (For me, a single oyster evokes elation then disappointment, its fleeting perfection leaving me greedy for more.) 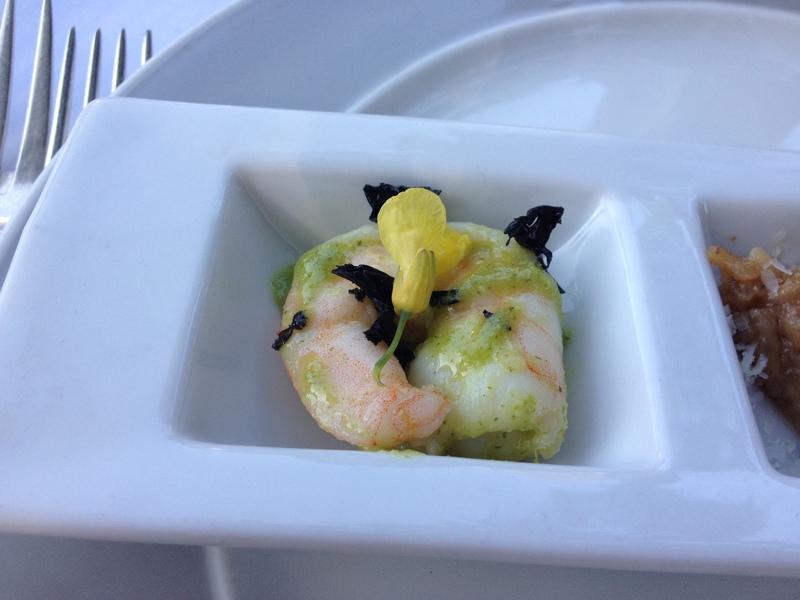 But there were other small plates to distract us after the divine briny bite. 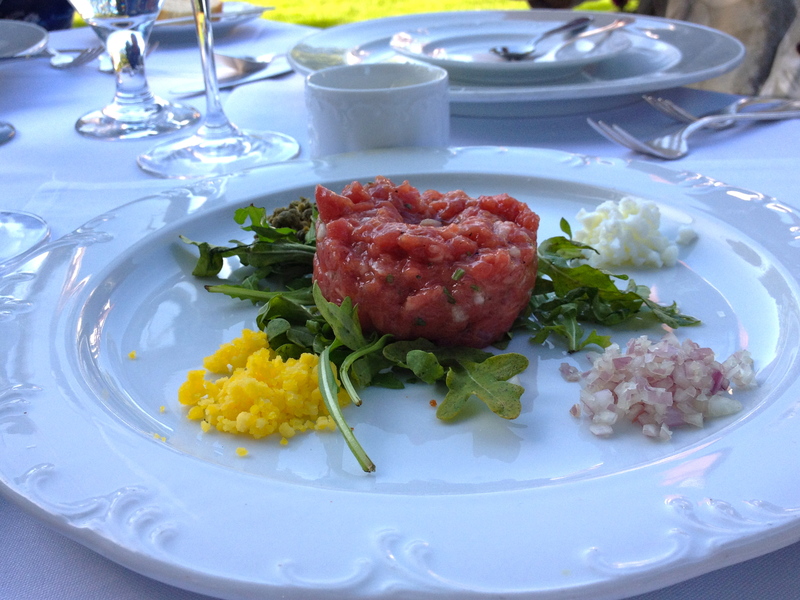 Next came a beautiful plate of beef tartare, infused with white truffles and served with brioche triangles, the beef tender and silky on the tongue. 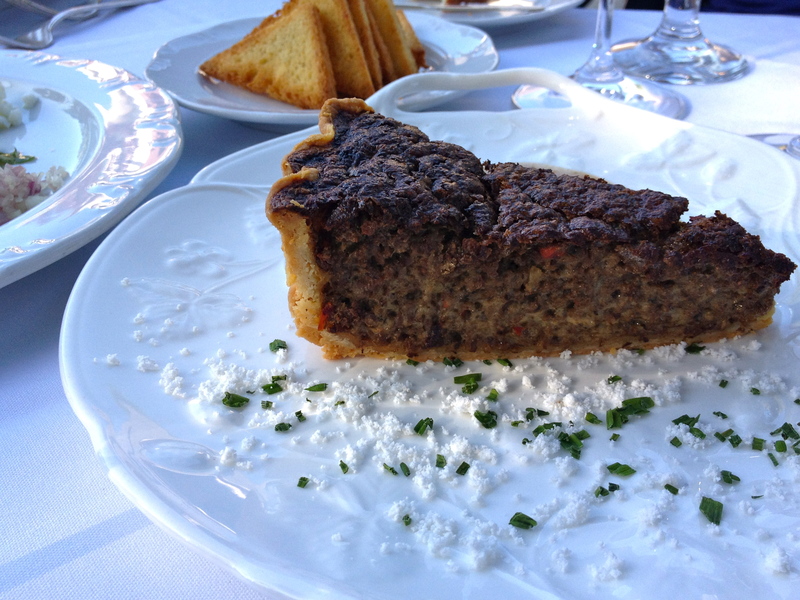 A generous wedge of three-mushroom tart followed, earthy, dense and flavorful with porcini sauce. 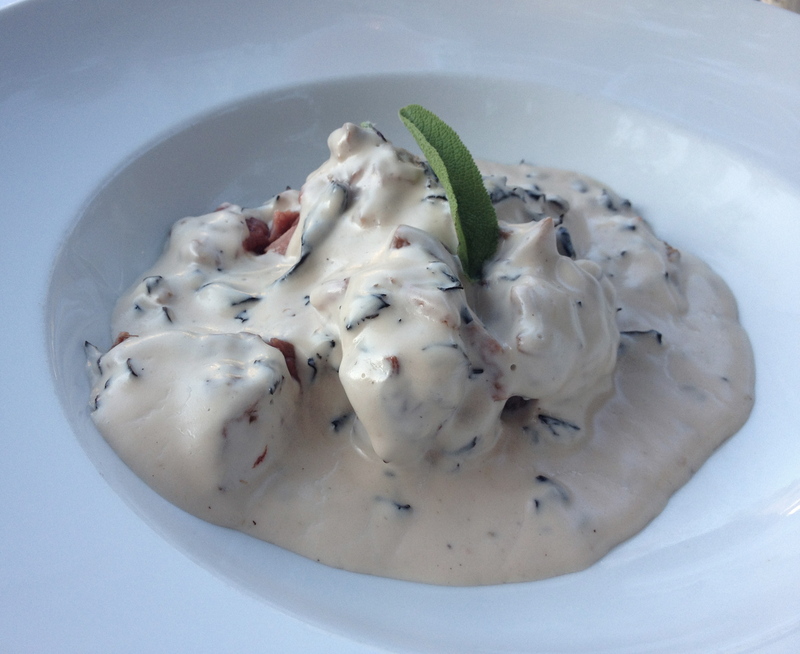 The guys ordered wild mushroom soup, and the rest of us dipped in, ooh-ing an aah-ing over the creamy deliciousness. For entrees, Zandra had butter poached Maine lobster over pasta with a mushroom and white wine cream sauce that caused ripples of entree envy across the table. J also indulged in pasta, a rarity these days, but the offering of morel mushrooms in a creamy truffle sauce over penne triumphed over any lingering willpower. And speaking of lacking willpower, James and I both were unable to resist the over-the-top house specialty, beef stroganoff. 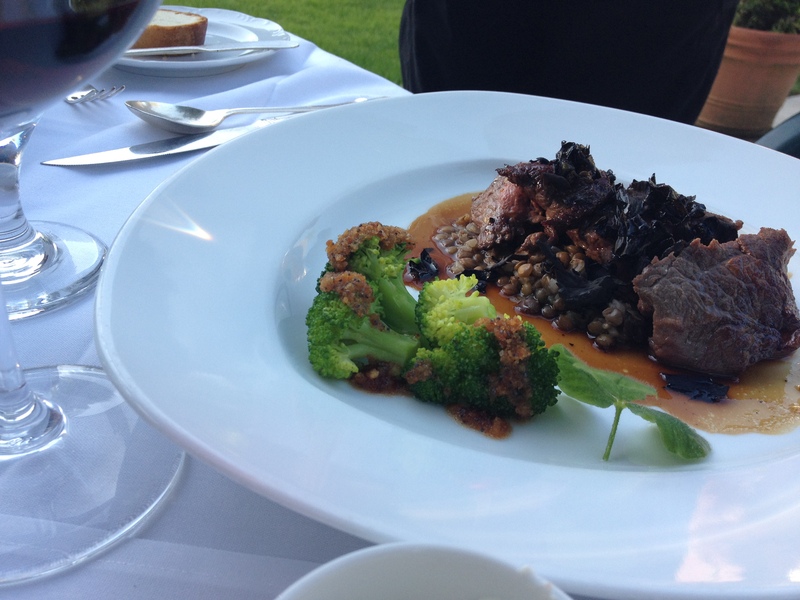 The beef, soft and flavorful, recalled the silky tartare from earlier, and the rice reminiscent of the wild-mushroom risotto from the amuse, all bathed in mushroom cream sauce. Luxurious is the first word that comes to mind. Indulgent is the second. The air still warm long after the sun had set, we drove away happy and sated. In our usual meeting spot where we had left our car, we gathered our wine and said goodnight to our family and our new friends, grateful for the fine camaraderie, a perfect day in our rear-view mirror. A beautiful gift from the sea. 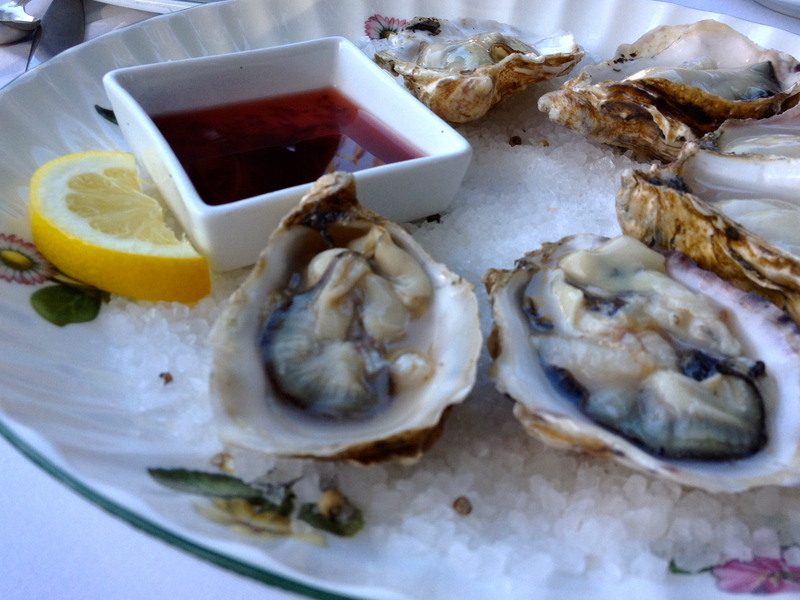 Yaquina Bay oysters with Pinot Noir mignonette. Heidi’s Three-Mushroom Tart with “white truffle snow” scattered on the plate. Creamy, rich, mushroom-laden beef stroganoff. 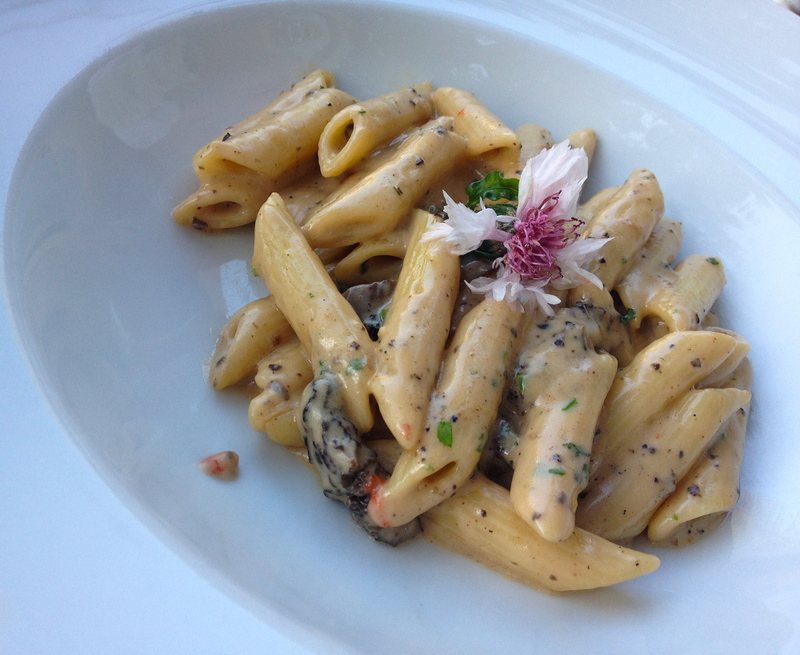 Another creamy indulgence: Penne with mushroom sauce. 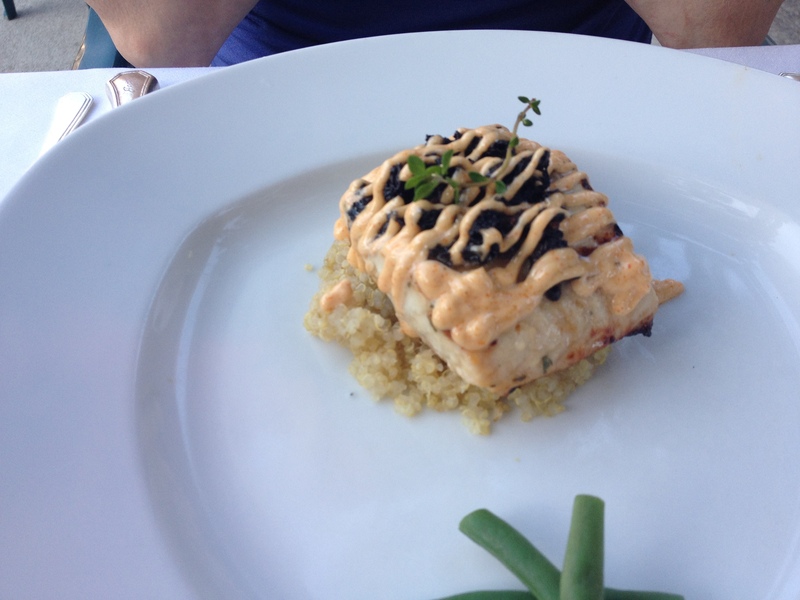 Michelle’s sturgeon with sauteed morel mushroom duxelle, over quinoa. Ken’s perfectly crusted elk — one of the nightly specials. I wish I wasn’t so far away in Boise. 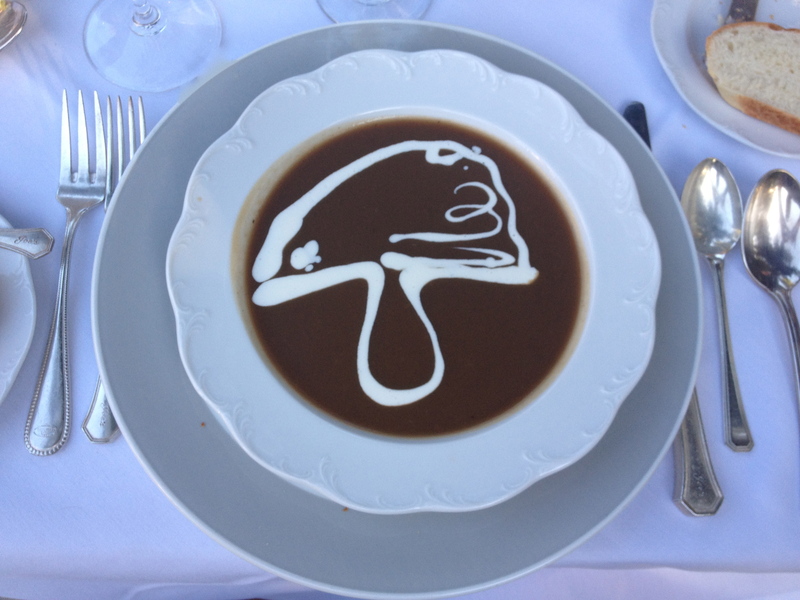 The mushroom soup was so artistic (with the little mushroom design) how neat…. Well, it’s not so far away! Let’s get together soon … I guarantee we’d cook up some pretty tasty meals!